Heuristics are simple rules (‘shortcuts’) used when making judgements. They are generally useful in that make decision-making more simple. In particular, heuristics help us when we need to make decisions quickly. However, sometimes these shortcuts send us off course. Representativeness is the extent to which an event is representative of its parent population. As such, when we rely on a representativeness heuristic, we often wrongly judge that something is more representative than it actually is. While representativeness heuristics provides an easy computation, we often overestimate the ability of these heuristics to accurately predict the likelihood of events. Representativeness heuristics can lead investors astray. For example, investors might be tempted to forecast future earnings using the short histories of high earnings growth observed in the past. These estimates are then used to price the company’s stock and could thus lead to overpricing. In this case, investors are failing to take into account the fact that the high earnings growth could just be due to chance. The high earnings growth is unlikely to repeat itself and might actually lead to disappointment. When future earnings are lower than forecasted, the stock price could drop considerably. Representativeness heuristics also cause us to see patterns in truly random sequences of data, or we might think that future patterns will resemble past ones. This behavior often occurs in finance when investors analyze charts of companies’ stock prices. Investors try to find patterns or trends from which they can then benefit. However, often investors only identify trends when they are already well established. As such, investors are more likely to react to them, rather than that they are succesful in forecasting changes in these trends. To illustrate our tendency to see patterns in random data, consider the following figure. If we only observe the magnified part of the chart, we might be tempted to assume that it is a continuously increasing series. However, this is not the case. This particular series is actually part of a larger time series, as shown in the fiture. Clearly, the set of observations is not representative of the larger population. 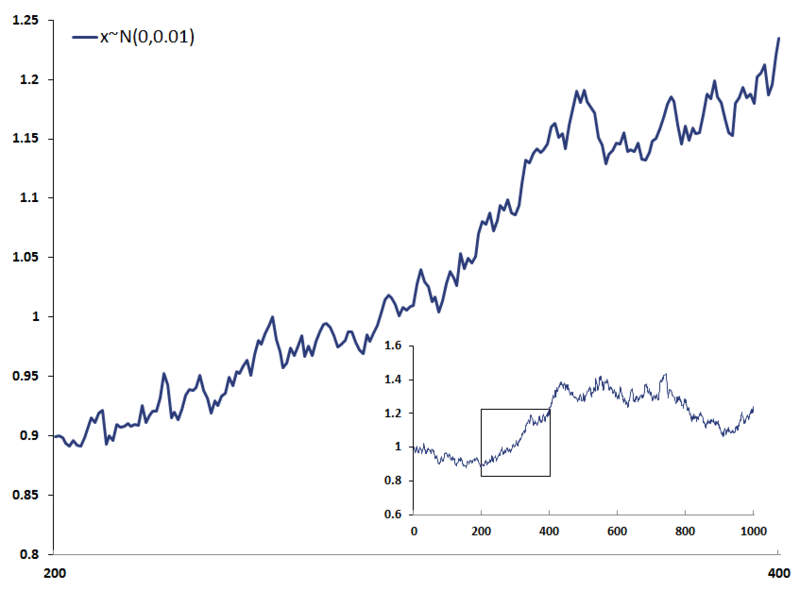 The time series we plotted above is an example of a time series where changes are random and normally distributed, i.e. x~N(0,0.01). Like a fair coin, the time series is equally likely to go up or down. A representativeness heuristic is often useful as is it makes decision-making easier. However, in finance it might cause us to draw wrong conclusions. For example, we might wrongly extrapolate the good recent performance of stocks.